Basic Hat Pattern Version 35 "Slightly Slouchy Hat"
There's yellow on top of the hat! Notes: Rounds 19-23, remember to crochet loosely! These stitches tighten up and then your hat will not go on your head! With color A ch 4, sl st in first ch made. Round 2. Ch 1, dc in same sp as ch 1, hdc in same sp as ch 1. Rounds 7-13. Repeat Round 6. Rounds 15-16. Repeat Round 6. Round 17. Ch 1, sc in same sp as ch 1, sc around. Sl st in first sc made. Round 18. Repeat Round 17. Rounds 20-23. Repeat Round 19. Round 24. Ch 1, turn. Sc in same st as ch 1. Sc in remaining sp. Rounds 25-26. Repeat Round 24. 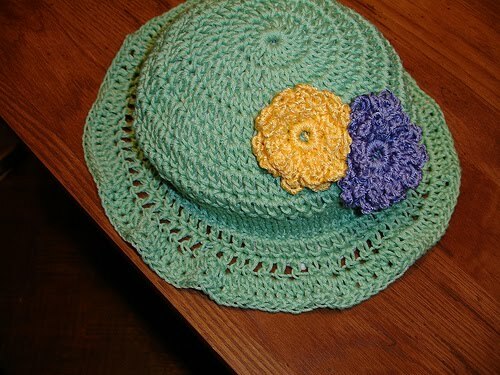 Notes: This colorful hat is great for children who have lost their hair due to a serious illness. Any combination of stripes or even a solid bright color would look awesome! This hat can be made into a slouchy hat by adding more rows of Round 6. To save time carry your color changes of yarn behind your stitches and crochet over them. Round 7. Repeat Round 6. Change to color C in last dc made. Round 8. Repeat Round 6. Change to color D in last dc made. Round 9. Repeat Round 6. Change to color E in last dc made. Round 10. . Repeat Round 6. Change to color A in last dc made. Round 11. Repeat Round 6. Change to color B in last dc made. Round 12. Repeat Round 6. Change to color C in last dc made. Round 13. Repeat Round 6. Change to color D in last dc made. Round 14. Repeat Round 6. Change to color E in last dc made. Round 15. Ch 1, sc in same sp as ch 1. Sc in remaining 59 sp. Rounds 16-18. Repeat Round 15. Round 19. Ch 1, hdc in same sp as ch 1. Hdc in remaining 59 sp. Round 20. Repeat Round 15. For your information: Red Heart worsted weight was used in this hat.